Many individuals and organizations – Women’s World Banking included – have been working to understand the outcomes clients experience as a result of accessing financial services. To this end, we have talked with clients through focus groups and interviews, developed large-scale surveys, and implemented complex research methodologies to assess impact. We try to measure how clients are using financial products, their participation in household decision-making, and changes in housing conditions, children’s education, health and nutrition. Yet at the core, what we are really trying to understand is how financial inclusion affects these clients’ well-being. Neli Esipova of Gallup World Poll and Leora Klapper of the World Bank tackled this very question during their “Strength in Numbers” session at Women’s World Banking’s Making Finance Work for Women Summit this past November. The session presented a unique take on the oft-cited Global Findex data. 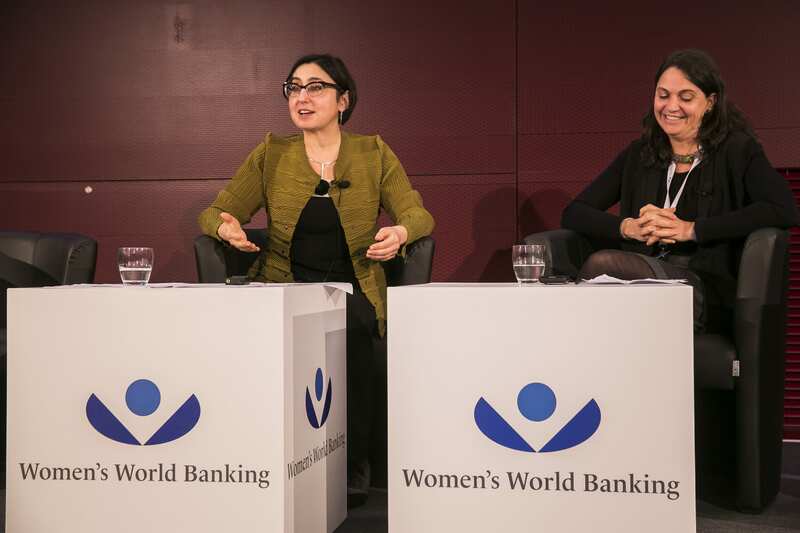 The speakers considered gender differences in financial inclusion, then went a step further to analyze how these access gaps affect women’s perception of their lives. Neli shared Gallup’s approach to measuring well-being, which goes beyond objective indicators such as income to look at subjective assessments. As Neli put it, the best experts on what makes women happy are the women themselves. Gallup uses both a “life evaluation” rating of how women see their life, as well as assessments of “positive” or “negative” daily experiences measuring how people live their life. .
On their own, Gallup’s well-being findings are interesting, but not unexpected: women in Denmark and Norway see themselves as “thriving,” while women in Afghanistan and Haiti see themselves as “suffering.” Where things get really fascinating is in cross-referencing this data with financial inclusion information. Leora kicked off this part of the conversation with a simple yet telling graph which showed a strong and clear correlation between account penetration and life evaluation scores. Even at the individual level, controlling for country, age, gender, education, income and employment status, we see a significant relationship between financial inclusion and well-being. These striking results beg the question of “why?” Leora offered a variety of potential reasons, ranging from personality factors (perhaps people who are savers are also more optimistic about the future) to the pride that results from the ability to save. For women in particular, she cited numerous studies showing the benefits of having a safe place to save, ranging from insurance against unforeseen risks to the empowering effects of having control over your own money. This is something Women’s World Banking has also found time and time again in our own research. 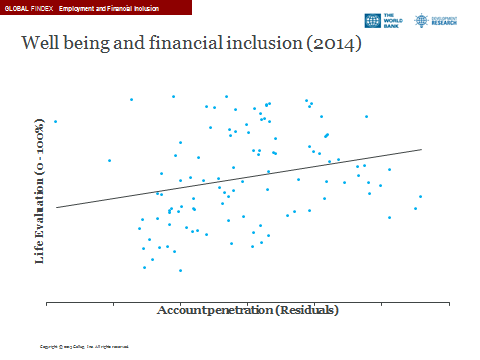 While we would need additional data to truly answer the question of why this correlation between financial inclusion and well-being exists, we are left with some very interesting hypotheses for further research! Leora and Neli also took us deeper into the data, to understand how the gender gap in financial inclusion is affected by such factors as employment status, and how employment status in turn impacts women’s well-being in different countries. The findings from such cross-disciplinary analysis are quite nuanced, but can still hold far-reaching implications. For instance, , in the area of wage digitization, Leora estimates that 120 million unbanked women globally could be brought into the formal financial system if their salaries were paid electronically instead of in cash. As a Research, Monitoring and Evaluation Specialist, the “Strength in Numbers” session left me excited to apply this innovative approach to data analysis in Women’s World Banking’s own work, and inspired me to be more creative in how I think about measuring the impact of financial inclusion for women. To learn more about the “Strength in Numbers” session at #MFWW2015, check out the full video here.